This half-meter resolution satellite image shows Port-au-Prince, Haiti after a 7.0-magnitude earthquake struck the area on Jan. 12, 2010. The image clearly shows extensive damage, roads covered with debris from collapsed structures, and people crowded in the streets and public places such as sports fields and stadiums. The white-colored National Palace shows damage along the roof line. The image was taken by the GeoEye-1 satellite from 423 miles in space on Jan. 13, 2010. Newimages taken from space reveal more of the destruction caused by the 7.0-magnitudeearthquake that hit Haiti on Tuesday.? Onephoto of central Port-au-Prince, near the epicenter of the Haitiearthquake, shows the Haitian National Palace, which collapsed. Thephotograph was taken Wednesday by the GeoEye 1 Earth-observing satellite. Theimagery also reveals extensive damage throughout the city, including roadscovered with debris from collapsed structures, people crowded in the streetsand in open public places, such as sports fields and stadiums. Many buildingsappear to be flattened. The white-colored National Palace shows damage alongthe roof line. Satellitephotos can help rescue workers. 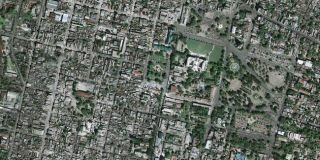 Followingthe Haiti earthquake,a group of organizations requested satellite data of the area from theInternational Charter on 'Space and Major Disasters,' in order to provide thisdata free to anyone affected by disasters anywhere in the world. The groupsinvolved included: French Civil Protection authorities, Public Safety ofCanada, American Earthquake Hazards Program of USGS and the UN StabilizationMission in Haiti. Thephotos taken immediately after the event can be used to generate emergency mapsto provide rescue services with an overview of the current state of the area. Thesecan be compared with situation maps generated from archived satellite data toidentify major changes on the ground caused by the disaster. Bycomparing before and after maps, officials can pinpoint areas hit the hardestand proceed to identify passable routes for relief and rescue workers,according to the European Space Agency, which also released a space-based photoof Haiti. Additionally, they can help to identify areas that are suitable forsetting up aid camps where medical support and shelter can be provided topeople.? Radarsatellites in particular can be valuable, as they can peer through clouds,which is an asset when weather conditions prevent the use of optical satelliteinstruments. Radar imagery can be used to identify hazards such as landslidesthat may be triggered by earthquakes like that in Haiti.